Floral splendor is in full bloom in this gold cross pendant from Apples of Gold. Given a traditional but classy look in 14K yellow gold, this pendant is sure to please. The middle of the cross pendant shows a beautiful four-petaled flower in full bloom. The arms of the cross feature a leafy motif to continue the floral theme. The clean, polished border encompasses the pendant with a smooth edge. This gold cross pendant takes all the bounty of nature and makes it into a gorgeous piece of jewelry. 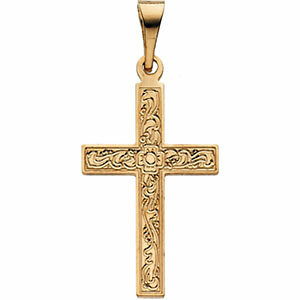 We guarantee our Floral Cross Pendant in 14K Yellow Gold to be high quality, authentic jewelry, as described above.